A Michigan district court judge determined last week that product liability claims against an FDA approved medical device manufacturer were preempted by federal law, but allowed the plaintiff’s claim of fraud against the manufacturer, Medtronic, Inc., to proceed at the state level. Although the court determined that plaintiff’s parallel state law product claims were insufficiently pled to survive preemption, it disagreed with the manufacturer that Current Good Manufacturing Practices (“CGMPs”) are too broad to potentially serve as the basis for parallel product liability claims in state court – a crack in the preemption door worth noting. The court similarly refused to hem in the plaintiff’s parallel claim of fraud despite the most general assertions of malice, knowledge and intent with respect to the manufacturer’s product representations. The case is Canary v. Medtronic, Inc., No. 16-11742, 2017 WL 1382298 (E.D. Mich. April 18, 2017). The provision has been interpreted as a two-prong test by the courts for determining if a state-law tort claim is preempted. First, the court must determine whether federal regulations exist for the device in question. If so, then the court must analyze whether the plaintiff’s product liability claims are anchored to any state law requirements out of sync with the provision. The Supreme Court has been careful to clarify that the MDA’s preemption provision should not hinder state and federal claims from being pursued in parallel if a state has made it unlawful to violate FDA regulations. The first prong of the preemption test was undisputed in the Medtronic case. The medical device at issue, a spinal cord stimulator, was an FDA regulated class III device subject to federal requirements. Medtronic challenged the second element though, asserting that the plaintiff’s reliance on nonspecific CGMPs to support its parallel state law claims would lead, prophetically speaking, to the establishment of safety requirements “different from, or in addition to” those provided in the MDA, and should be preempted. The judge disagreed, emphasizing that CGMPs are federal requirements, and if they are violated, the state has the right to provide a damages remedy—just as it would for any other federal regulation violation relating to the safety or effectiveness of a medical device. Furthermore, the court reasoned, “a distinction between concrete product-specific requirements and more general requirements would leave injured patients without any remedy for a wide range of harmful violations of federal law.” For instance, what if a factory worker’s blood contaminated a device, resulting in an infection in a patient? This is not a product-specific defect; however, current CGMPs require manufacturers to “establish and maintain procedures to prevent contamination of equipment….” 21 C.F.R. § 820.70(e) In its decision, the court drew from the Sixth and Seventh Federal Circuits, which have permitted CGMP violations to germinate parallel state law claims, suggesting a growing trend that medical device companies need to pay attention to. The court nevertheless preempted the plaintiff’s product liability claim. Medtronic was lucky though; the plaintiff had not rigorously prepared its allegations. Instead of focusing on just a few CGMPs that the defendant allegedly violated, the plaintiff provided a “laundry list” to the court full of vague and conclusory allegations. The judge emphasized, a plaintiff “cannot simply incant the magic words” that the manufacturer violated FDA regulations to make preemption vanish. Still, she gave the plaintiff a second chance to consolidate her claim. 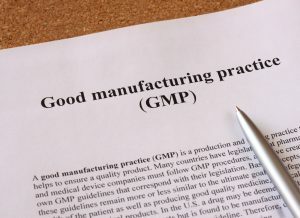 The plaintiff, who had suffered an allergic reaction to latex used in the device, ultimately honed in on a CGMP that requires the removal or reduction of any manufacturing material that could harm the device’s quality. Again, sloppiness saved Medtronic—the court made an easy distinction: the latex used in the device was not a manufacturing material, which is defined as a “residue or impurity,” but was present “by design or intent of the manufacturer.” 21 C.F. R. § 820.3(p) Latex was a component of the finished product that had been approved by the FDA. No violation. While it dismissed the product claims, the court did demonstrate willingness to move into broader territory to substantiate parallel state court claims by upholding the plaintiff’s allegation of fraud. The fraud claim arose out of several alleged conversations the plaintiff had with a Medtronic representative, who had repeatedly assured her that implanting the spinal cord stimulator would not cause an allergic reaction, and that no other patients with allergies to rubber or latex had experienced an adverse reaction. After the device had been implanted and the plaintiff experienced a serious allergic reaction, the Medtronic representative allegedly admitted to being aware of other patients who had suffered allergic reactions. Medtronic contended the plaintiff had only offered “conclusory allegations” that its representative “had knowledge of other patients having allergic reactions….,” and had not “state[d] with particularity the circumstances constituting fraud or mistake,” Fed. R. Civ. P. 9(b) as the Rules of Civil Procedure require. The judge agreed with the plaintiff’s assessment of the rule though, which also provides that “[m]alice, intent, knowledge, and other conditions of a person’s mind may be alleged generally.” The alleged conversations between the company representative and plaintiff were accepted as sufficient facts to sustain a claim under Michigan law. The moral of this decision for manufacturers is two-fold: 1) violation of CGMPs can substantiate parallel state law product claims – attack the specificity and sufficiency of those allegations to obtain dismissal; and 2) Michigan state law fraud claims predicated upon allegations of malice, intent or knowledge may persist despite lack of particularity. Check your state’s law to ascertain whether this decision is applicable in your jurisdiction, and in particular, whether the learned intermediary doctrine can alternatively substantiate dismissal of this type of claim. In the most general terms, the learned intermediary doctrine can shield a medical device manufacturer from liability when it provided all of the necessary information to a “learned intermediary” or physician, who then interacts with the patient.